We also have considerable experience with high density polyethylene conduit (including the proper tools and equipment for this specialized, application-specific conduit), PVC coated rigid conduit, aluminum conduit, stainless steel conduit and fiberglass conduit. Looking for professional electrical experience in cable tray design and installation? 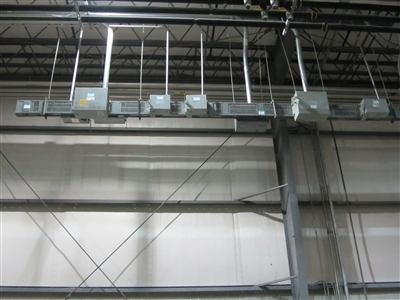 Whether it’s steel, aluminum or indoor/outdoor cable trays, we’re experts at cable tray design as well as installation. Buying or moving equipment? You want a flexible electrical feeder distribution system that can grow and change with your business. Young Electric can design and install a custom buss-way system that’s just right for your particular application. This allows buss tap switches to be installed anywhere along the length of the buss-way, which will save you time and money today – and tomorrow. When you’re talking about industrial electrical needs, keep in mind we also have trenching and excavating equipment for underground feeders and our own certified bucket truck for overhead feeders. This warehouse bussway configuration enables extreme flexibility for growth from equipment additions or transfers.